A solid all round photo printer that is great for its size, but there are better photo printers for the home and price. Any photo enthusiasts that want excellent quality prints. 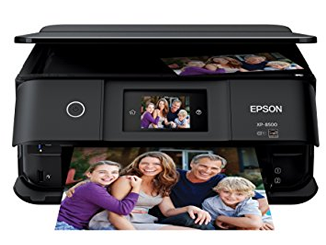 The Epson XP-8500 has a solid mix of functionality, ease of use and fantastic print quality, but just falls short of the Canon TS9050 to be a top recommended photo printer. 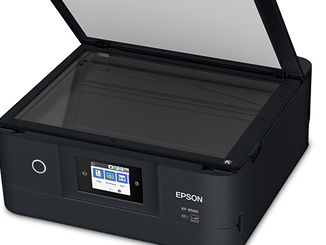 It's still fantastic though, so if you like Epson this is the printer for you. One area the XP-8500 falls down is connectivity options, sacrificing both an ethernet port for physical networking, and NFC communication. Whether this is important is entirely specific to you, but it's a feature it's missing compared to similar priced home photo printers. Normal documents come in around 9 pages per minute (ppm), fairly slow but good enough for the small amount of documents you should be sending through the printer. As mentioned further down this review, the cartridges are not a large capacity so anything other than photos will eat through your ink annoyingly quickly. Using the duplex drops this speed perfectly in half, around 4.5ppm for 2-sided printing. Again, not the fastest, but good enough. Quality is very good. 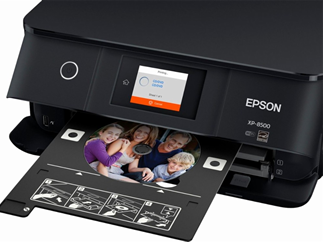 Epson have long been frontrunners with Canon providing the best home photo printers as the XP-8500 is no exception. Regardless of whether you're printing bright, vivid snaps, broad blue vistas or flesh-tone filled family pictures, the XP-8500 will give excellent results. Due to the printer utilising light cyan and light magenta cartridges you enjoy a brilliant possible colour gamut that really opens up the appearance of your prints. Photo enthusiasts definitely won't be disappointed. Overall, though the print quality is brilliant, printers like the Canon Pixma TS9050 just handle all your printing options better whilst still providing equally good prints, so the XP-8500 doesn't become our top rated photo printer but it is definitely good enough that we'd recommend buying it. The Epson Expression Photo XP-8500 takes six individual ink cartridges, all part of the Epson 378 ink cartridge range. Standard capacity, giving up to 240 pages in the black and 360 pages in the remaining five colours, have a tiny capacity and are best avoided. The higher capacity 378XL inks give up to 500 pages in the black and up to 830 pages in the other five colours, representing much better value. Running costs are what you'd expect in a photo printer printing photos. Using the industry standard 5% page coverage you're looking at 2.92p for a full set of standard Epson 378 inks and 2.33p for a set of the Epson 378XLs. This drops to 1.25p when using the excellent compatible Epson 378XL inks. These are all decent running costs, the only issue is how small the capacity in the black is. This provides a major stumbling block for the XP-8500 doubling as a home printer, as you'll quickly eat through the tiny capacity printing normal documents and is one of the major reasons we recommend the Canon TS9050 overthis printer. It's a shame Epson didn't make the cartridges higher capacity. Photo enthusiasts who aren't planning on printing many normal documents in their machine, or anyone wanting a small photo printer that won't take up much desk space. The Epson XP-8500 is an excellent, small machine that will give great photo prints, it's as simple as that.